I am always tinkering with the design and construction of the Camping Kitchen Box Chuck Box, and yesterday I did a pretty major revision on the drawers. Below is the end results front and back. Beautiful aren't they? 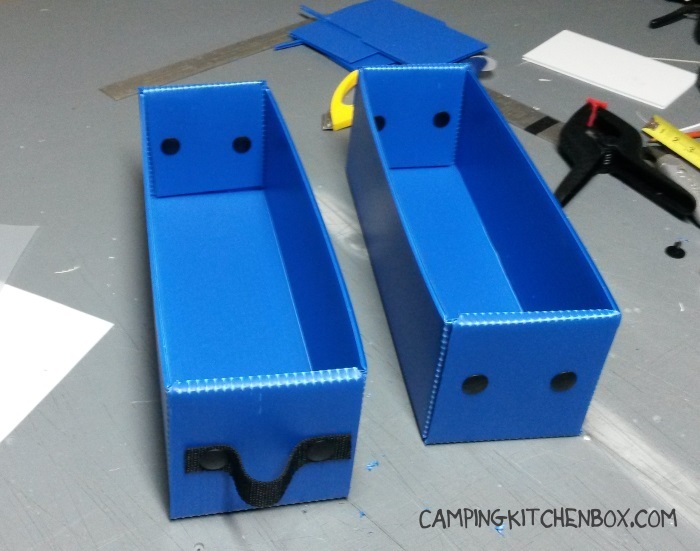 OK beautiful for drawers made out of blue corrugated plastic... But how are they different from the old drawers? Below is a comparison shot... New on the left and old on the right. You may notice the main reason I did this, to eliminate the exposed 'End Grain' edges. With the new drawer all the edges are nice and smooth as a plastic baby doll's bottom. How come I didn't do this before? Previously I was using 6 mm plastic corrugated (the same as I use for the rest of the box), now I am using 4 mm for the drawers. It is possible to cut, bend and shape the 4 mm in ways that just cannot be done well with the 6 mm plastic. Yes the drawer is not as overbuild as is was before, but it is still more then strong enough to do it's job. And a final shot of the drawers in place in the box. I Might play with the pull strap length a little, but overall I am very pleased with myself.